Your Chinese better than David Cameron? Sure. It might be too early to predict that Mandarin, the official Chinese language, will surpass English and dominate the world as the common language in future. But it is definitely clear that the population of Chinese speakers (1,197 millions including Mandarin and the other Chinese dialects, 848 millions who speak Mandarin) is massively larger than the population of English speakers (335 millions), even taking the number of Indian English speakers into account. Recently Mr David Cameron and Mr. Mark Zuckerberg have also joined in this language family. Through his Chinese New Year message, Prime Minister passed the blessing of a Fire Monkey Year. He stressed this was a fire monkey year, which is unusual and profound understanding on Chinese zodiac (Shēngxiào). According to the Chinese zodiac, Chinese symbolise each year with one animal and a total of 12 animals represents a 12-year mathematical cycle. Zodiac originates from the similar concept in western astrology and means “circle of animals”. Zodiac still remains popular in several East Asian countries including China, Vietnam, Korea, Japan, Philippines, Thailand and Mongolia. In addition, Chinese zodiac integrates Chinese traditional theory of “Five Elements”, which attributes the world into Metal, Wood, Water, Fire and Earth. The circle of years could be reflected by the circle of five elements. 2016 is a year of Fire according to Chinese calendar. This is why Mr. Cameron said it was a Fire Monkey Year. Better than our Prime Minister, Mr. Zuckerberg showed his fluent Mandarin with his wife, Mrs. Priscilla Chan, a Chinese-descent Vietnamese, who seems to preserve her née name after marriage as Chinese do today, and their new-born daughter Chen Ming Yu. Mr. Zuckerberg gave a perfect explanation on his girl’s name in their new year greeting video. 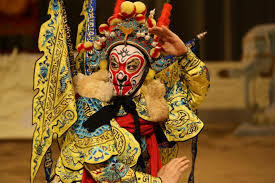 In China, the monkey is more remembered as the Monkey King (the right in Beijing Opera) from Chinese classic masterpiece Journey to the West, which can be regarded as the mixture of The Lord of Rings and The Pilgrim’s Progress. 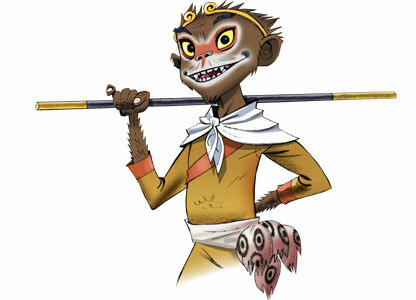 BBC once created one innovative and fascinating symbol of the Monkey King (the left) for 2008 Beijing Olympic Game. 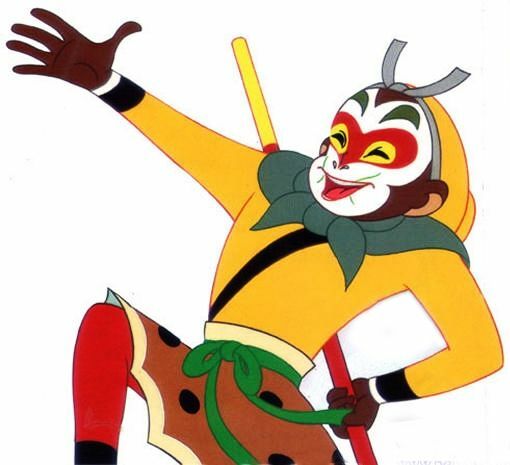 Here an authentic Monkey King (the middle in Chinese cartoon) can be seen in the famous Chinese cartoon Havoc in Heaven (1964). Be careful your tones and welcome to our Brown Bag Meeting this Wednesday (12:00, TA131) where we will report a study on Chinese lexical tone.